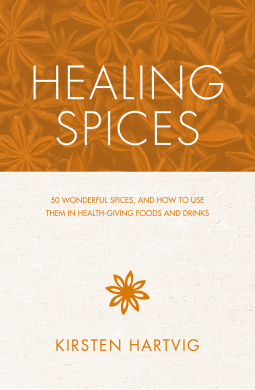 Healing Spices written by Kirsten Hartvig and published by Watkins Publishing is a very good, enchanting, magical book about the world of spices. Spices are commonly used in the USA for baking, cooking, but we still know that they can heal also our body? Yes: as in the past herbs were for example our medicines, when chemical medicines didn't exist, spices have the same role. It's a fascinating trip this one presented by Kirsten Hartvig, and it will be bring you to a great quick but intense History of Spices long something like 4000 years. Spices once were more precious than gold and just rich people could afford them. In the past if some sailors were able to enter in possess of just three-four spices, nutmegs etc, re-selling them to someone else, they would have become immensely rich. Spices in fact in the past were reasons of conflicts, wars and their prices prohibitive for common people. Spices became with the time very affordable and with also the intense cultivation not just where spices were "born" but also in other countries, let's say that now the situation is tranquil and everyone can cook and bake with them. 50 spices and super-spices taken in considerations in the book with great curative powers. Some of them: Cumin, Ginger, Chilli Peppers, Cardamom, Nutmeg, Lemongrass, Juniper, Pomegranate, Vanilla, Saffron, Tamarind. Each spice analyzed by the author. Food profile, nutritional profile, health profile, adding sometimes some notes. More than 100 delicious and yummy recipes will be later proposed. Each recipe will let you discover the nutrient balance, vitamins and mineral contained plus health benefits. Go for it, this book is wonderful and can be also a very good gift for some friends! Thanks to Netgalley.com I read this book.